The Hyndburn and Ribble Valley Police Cadets have been out and about helping in the local community and raised more than £2000 in the process! Cadets have been bag packing at Sainsburys in Clitheroe where they raised over £600, collected £400 at a fundraising event at Oswaldtwistle Mill and took part in a sponsored walk where they raised more than £1000. 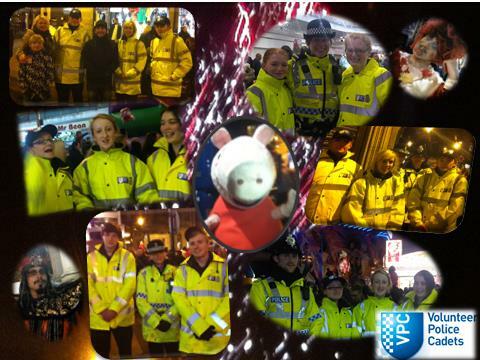 The Senior Cadets also helped out at the recent Accrington Christmas Lights Switch on, where they buddied up with several special constables and patrolled the town centre. Members of the public will also see the cadets out in Great Harwood on 14 December with the Neighbourhood Police Teams handing out jingle bells and crime prevention advice. Sgt Kathryn McIntyre who co-ordinates the cadet scheme in Hyndburn and the Ribble Valley said: “This is all in addition to their weekly club sessions at Accrington & Rossendale College where they have been learning about Trading Standards, ARU, practising on the Police Radios and fitness tests.